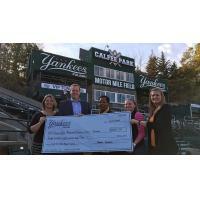 PULASKI, Va. - The Pulaski Yankees presented LewisGale Regional Cancer Center at Pulaski with a donation of nearly $1,000 last Wednesday from proceeds raised during the team's cancer awareness night on August 13. During Calf-E's Fight Against Cancer presented by Gay & Neel, Inc. the Yankees raised $887 through a dunk tank and by donating $1 of all gameday ticket sales. "During our 2018 cancer awareness night, we were able to spotlight nine different types of cancer - one per inning - and also raise funds to support cancer research and cancer care here locally," said Pulaski Yankees General Manager. "We appreciate the tremendous fan support in helping to raise these funds and also thank Gay & Neel, Inc. for their sponsorship of Calf-E's Fight Against Cancer. We're proud to donate these proceeds to our friends at LewisGale to support the great work they're doing to help cancer patients." "We are so appreciative of the great partnership between LewisGale and the Pulaski Yankees," said Sean Pressman, CEO of LewisGale Hospital Pulaski. "The Yankees' generous gift will help in the treatment and recovery of many cancer patients across the community." The 2019 Pulaski Yankees schedule will be available in the coming weeks. Season tickets for the 2019 Pulaski Yankees schedule are now on sale and can be purchased by calling (540) 980-1070. Additional information about season ticket plans and 2019 sponsorships can be found at pulaskiyankees.net.